The hotel is 70 kms from Cochin International Airport and 16 kms from Kottayam, just an hours speed boat drive or 90 minutes by road from Cochin. 53 Air conditioned Cottages with an ethnic ambience and with modern facilities, like Fridge, Television with satellite channels, Telephone, and attached toilets with natural Ventilation. 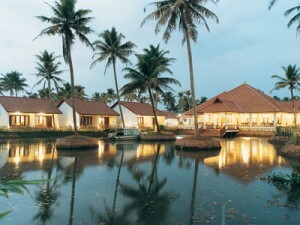 The resort is spread out and built in Traditional Kerala style. The luxury bamboo pool villa offer independent, luxurious, charming, rustic rooms, quietly blending in with the surrounding. The villas are spacious, comfortable and beautifully furnished, yet retain the style and simplicity with private garden, private plunge pools with Jacuzzi and open-air garden showers. A restful private verandah overlooks the garden. The cottages include guest amenities like international direct dial facility, color television, mini bar with non achoholic beverages, coffee maker and hair dryer. The Lagoon/Garden facing Cottages overlook the aesthetically landscaped garden and lagoon .Includes all of the above guest amenities (Coffee maker on request). These Suites with private sit outs overlooking the lagoon and lake with Jacuzzi and open air garden showers are the ultimate in luxury. Well equipped with guest amenities like international direct dial facility and color television with satellite programmes, hair dryer. Luxury Tax 12.5% is applicable on the above. Guests can look forward to our quality facilities and unique services. » Vedhi – A/c Meeting/ Banquet Hall with built in Kerala style architure . Its cool interiors is ideally suitable for gatherings with a capacity of 125 persons. use the Swimming Pool, Fitness Center and Ayurveda Centre etc. » Water sports on request. Grannery – the multi-cuisine restaurant built in typical Kerala style architecture . offering delectable varieties of Indian, Chinese, Continental dishes and seafood specialties. Ayurveda is the oldest surviving complete medical system in the world. Derived from its ancient Sanskrit roots – ‘ayus’ (life) and ‘ved’ (knowledge) – and offering a rich, comprehensive outlook to a healthy life, its origins go back nearly 5000 years. To when it was expounded and practiced by the same spiritual rishis, who laid the foundations of the Vedic civilisation in India, by organising the fundamentals of life into proper systems. Guests can take benefit of our recreation activities for irresistible fun and relaxation. Sunset cruise in Motor Boat. 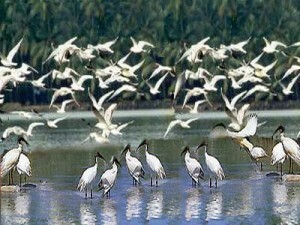 If you have not decided yet or wants to customize tour itinerary or hotels listed above in "Abad Whispering Palms Lake Resort Package in Kumarakom Rs.6500/-", then we can change the travel itinerary and make a personalized, tailor-made holiday package, especially for you. We can modify this travel package as per your itinerary, budget, duration and the tourist places you would like to visit, including transportation and airfare should be included or not. Please fill the form below to contact us.